More than 40 Māori chiefs signed a treaty with the British Crown in the Bay of Islands. This ‘Treaty of Waitangi’ remains controversial. A week earlier, Captain William Hobson had landed at Kororāreka from HMS Herald and proclaimed himself lieutenant-governor of a colony that did not yet exist. His instructions from the Colonial Office in London were to seek Māori consent to British sovereignty. Officials drafted a document to present to a hui of prominent chiefs, especially those who had signed the 1835 Declaration of Independence (see 28 October). Missionary Henry Williams and his son Edward translated the English draft into Māori on the night of 4 February. Its three clauses transferred kawanatanga (governorship) from the Confederation and individual chiefs to Queen Victoria; guaranteed Māori continued possession of their taonga (property), with the right to sell land to the Crown should they wish; and granted Māori the ‘rights and privileges’ of British subjects. On the morning of 5 February, about 500 Māori, Hobson’s retinue and local Pākehā gathered on the lawn in front of British Resident James Busby’s house at Waitangi. After Hobson spoke in English, Henry Williams explained in Māori that the treaty was an act of love by the Queen and Busby emphasised that it protected land rights. Much of the subsequent kōrero – translated for Hobson by the missionaries – favoured the status quo, with missionaries rather than a governor as protectors of Māori. Some chiefs also foresaw the loss of their land. The tide was turned by two influential rangatira, with Tāmati Wāka Nene declaring it was too late to stop Pākehā arriving and Hōne Heke Pōkai advocating a covenant between Māori and the Queen. Informal debate continued that evening. Hobson had announced that the hui would reconvene on the 7th, but many chiefs were eager to leave for home. When they assembled outside Busby’s residence on the morning of 6th, Hobson was summoned hastily from the Herald to accept signatures. 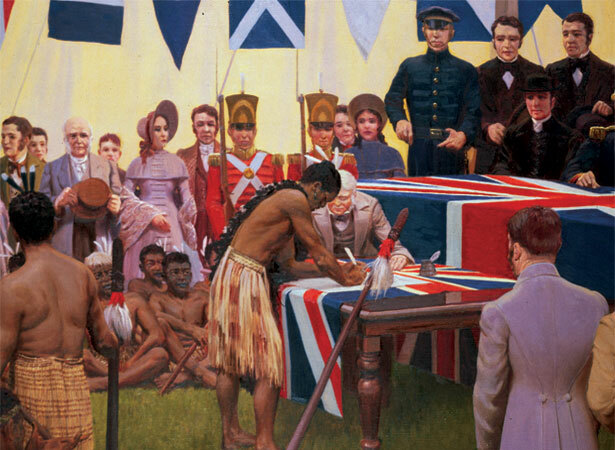 By September 1840, another 500 Māori had signed one of the nine copies of the treaty and British sovereignty over the whole country had been declared. We have 25 biographies, 9 articles, related to Treaty of Waitangi signed.